What does it sound like when you mangle the sound of a florescent light being switched on with granular syntheis? "Emits a Photon" is the answer – a free granular synthesis patch for Camel Audio Alchemy. This sample was recorded in my dorm at Electro-Music 2010 Festival. Listen to the audio demo for some notes on how I created this patch. Modwheel controls filter. 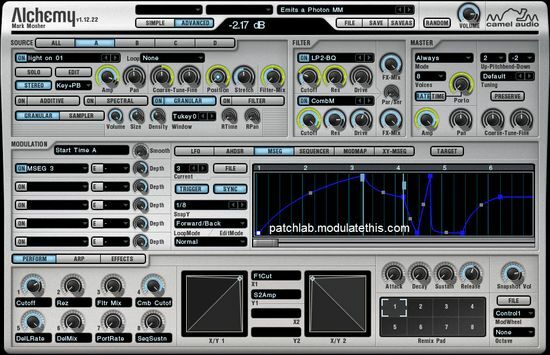 In your AlchemyPresets folder create a sub-folder called "Modulate This Patch Lab"
From Alchemy click "File->Load" then select "Emits a Photon MM.acp" and click "Open"